I think the Dolly Parton is more commonly used, is it not? (06-29-2015, 03:29 PM)panamaniac Wrote: I think the Dolly Parton is more commonly used, is it not? And if that piece of locker room humour disappeared tomorrow, nothing of value would be lost. (06-18-2015, 09:49 PM)panamaniac Wrote: A large For Sale sign has gone up at 287 King E (corner Eby). The house behind that building is also for sale and the lot next door on King St has been vacant for years. It would be nice to see the properties consolidated for a new building. I don't know whether it means that the properties have sold already, but the CBRE signs on these properties are already down. When you click the Google search result for cbre 287 King st E, it leads to a broken link. I've noticed that Google Street View now has images from May of 2015. (07-01-2015, 10:02 PM)Pheidippides Wrote: 240 King St E? ha ha ha- that was taken last Saturday- my little bug on Market Day. why is that little sliver of a building still there? what was it and why wasn't it included in the development next door? (07-02-2015, 08:29 PM)Smore Wrote: why is that little sliver of a building still there? what was it and why wasn't it included in the development next door? I don't know what it was originally, but for many years it housed a children's clothing store called the "Little Pinto Shop" that was still in operation when the tower next door was built. It is cute - too narrow to have an entrance on the front, the door is on the east side. There used to be a little addition on that size that contained the entrance and another small display window. In Tokyo that building would be narrower (maybe only 3m wide), have a front entrance -- and maybe six stories. The building and houses on the northeast corner of King and Louisa have all been boarded up. I hope the demolition will follow as soon as the roadworks are finished. If I recall correctly a mid-rise mixed us building is planned for the site. 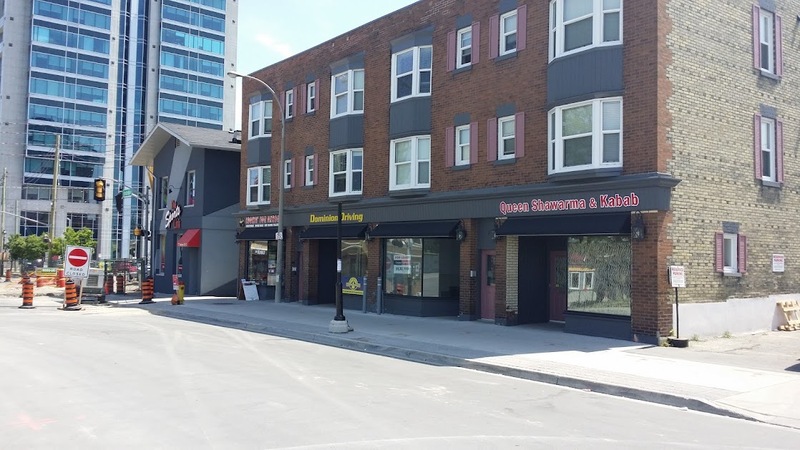 The unit under renovation at 93 Ontario S has new signage for 'Queen Shawarma & Kebab'. Given the Hasty Market immediately next door is already serving Shawarma, this seems a bit overly dense to me. Some day I'd like to see Ontario St as a good commercial/retail strip extending from Joseph all the way to Weber.